I think we’re on to something here; our model is working—better than expected. The ideal Himalayan Aid volunteer has a friend in Nepal (Booth met his on the plane ride in) or an area they’d like to help. We provide logistics, materials, transport and seek out local knowledge and expertise. From there onward, our volunteers run their own show. Leslie Brown is a prime example of this method working to perfection. 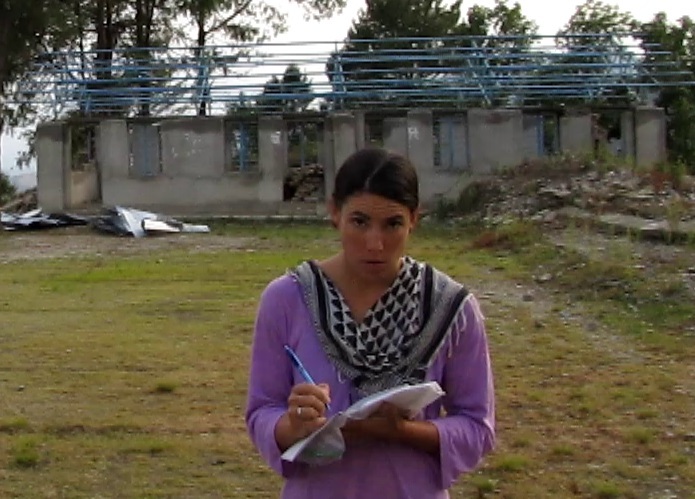 She just returned from Dhading after a grueling day of sorting and delivering metal sheeting. Excerpts from her email are reproduced below. We helped her set up the delivery and she did the rest. Now she has a good level of knowledge about a specific area in Nepal and a local team to help her with any future projects she may want to try. 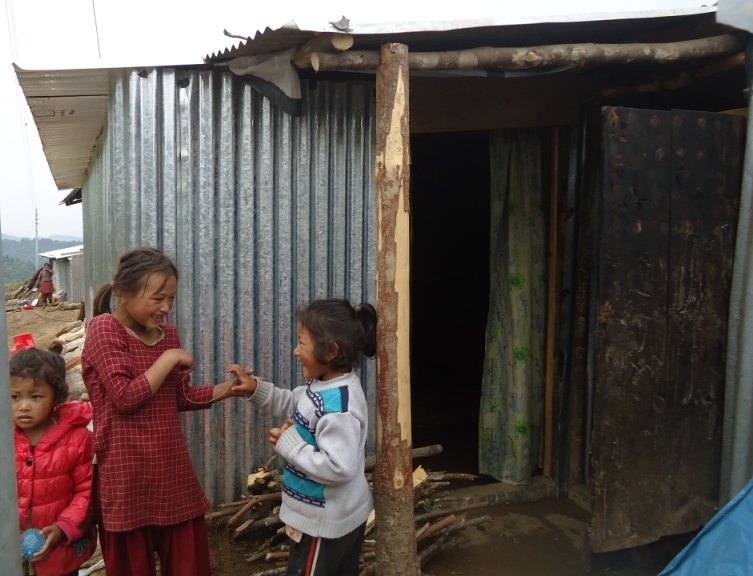 She’s set up her own fundraising and will, essentially, now become a little Himalayan Aid of her own. Bravo. We will be looking to help a lot more people like Leslie this fall as we swing full steam towards school reconstruction and refurbishment. Never been to Nepal but would like to come and help anyway? No worries: Come out and we’ll help you find your own comfort level and work load. I am writing to share with you the tremendous impact of your generous donation to Himalayan Aid and the Ama Foundation’s earthquake relief project in Dhading District, Nepal. I visited Belingtar village two days after my arrival here on May 27th. This village is the birthplace and home of two Nepali girls I have befriended, 16 year old Sujina and 12 year old Sushma, and their family. 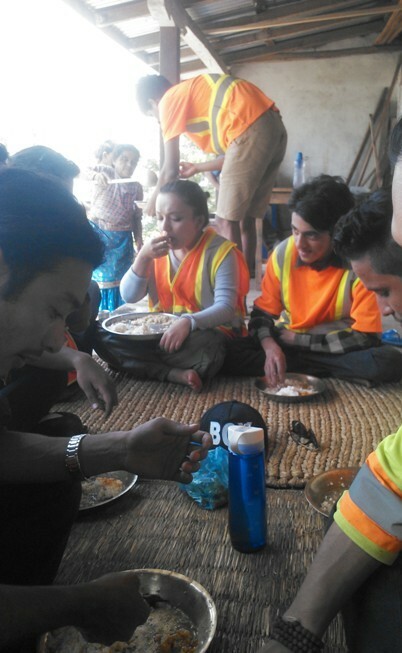 They called and asked me to come up as their house had been destroyed in the earthquake. When we arrived there, we saw that all the houses in the village had been severely damaged or totally destroyed. 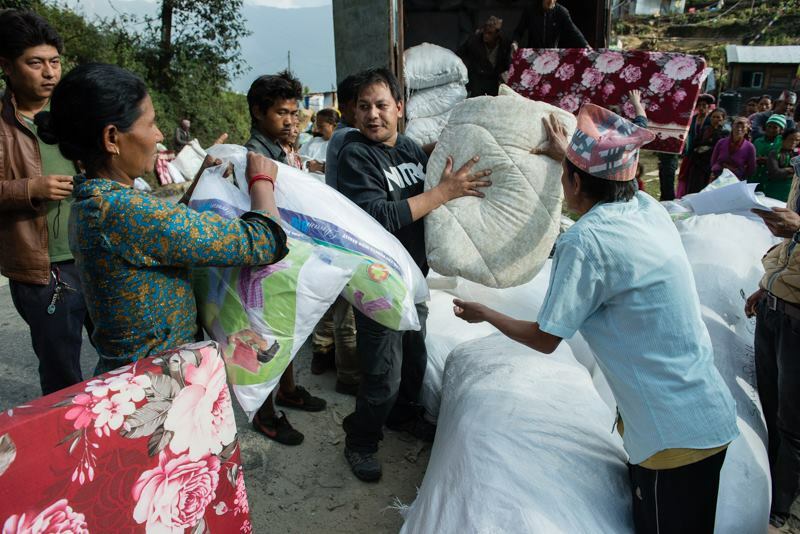 The villagers reported to us that the local authorities had not provide much in the way of relief supplies, only one tarp and one blanket per family. They were most concerned with having shelter from the coming monsoon rains, for themselves, their livestock, and their food supplies. 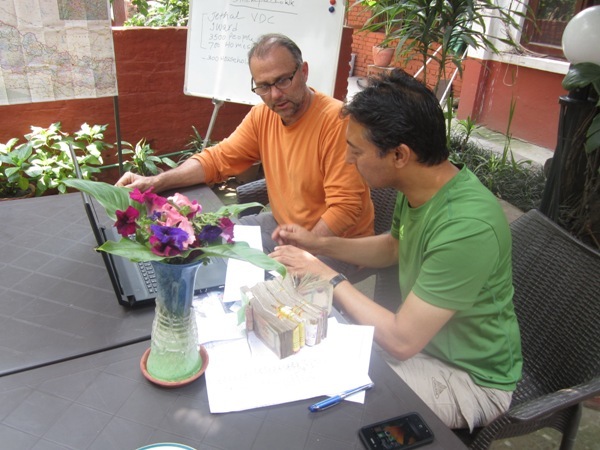 When I returned to Kathmandu, I collaborated with ADRA Nepal , a large INGO who was working to deliver sheet metal and other supplies in five VDC’s in Dhading. However, they told us they hadn’t even begun the “tender” process to acquire sheet metal, and didn’t plan to buy enough for all the families in all five VDCs. As I made inquiries and researched the government process set up for earthquake relief, I learned that INGOs were to register with the CDO of the affected district and identify which areas they were committed to serving. Through communication with ADRA Nepal and the VDC of Kalleri, I was able to communicate our intention to provide sheet metal to Belingtar village. However, my Nepali friends in Belingtar told me about a more remote village , Baseri, which is poorer and more severely impacted by the earthquake. My colleagues went to Baseri village on an assessment visit, and took along 500 dignity kits of supplies and hygiene items for the women and girls there. Again , they found that every house had been destroyed. When their report was received, we also learned of two smaller villages in the ward. When we reviewed the photos and learned the situation of these families, we decided to commit to raising funds and supplying sheet metal to all four villages of Ward 6, Kalleri VDC in Dhading. The total number of families in Ward 6, according to the VDC Secretary, is 378 families. Much coordination and logistical planning was required as we met every few days to plan how to accomplish this. 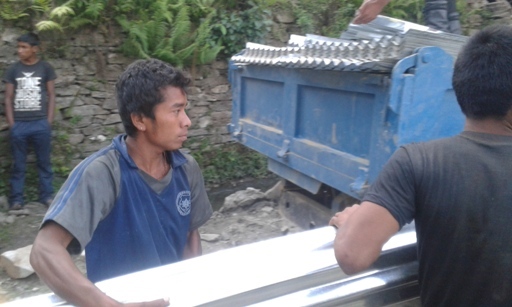 Sheet metal has been at shortage throughout Nepal and has to be ordered from India. The GoN placed a 35% customs tax at the border, holding everything up. We heard stories of a large INGO who had 50 trucks sitting at Birgunj awaiting clearance from the GoN to enter the country. Finally, we got word that our first order of 194 bundles of metal had come in. With the help of Helen Gurung, Sano Paila Regional Manager; KB Rana, Sano Paila Project Coordinator; Rupak Shrestha, driver and friend; Rakesh Shrestha, uncle of the two girls whose family lives in Belingtar; Jim Rinaldi, procurement partner; his Nepali logistics coordinator Navaraj; two American volunteers, Booth Teeters from Washington, and Carter Sobon from Sacramento, CA; Eriko Shrestha, a young Nepali high school graduate; and Bonnie Ellison, advisor and supporter; we were able to procure and deliver sheet metal last Wednesday to 194 families in Kalleri VDC. We hired a jeep to travel with the truck up to 28 Kilos, the small area just off the road from which we were going to distribute the metal. After a three hour drive, we arrived at hot, dusty 28 Kilos. 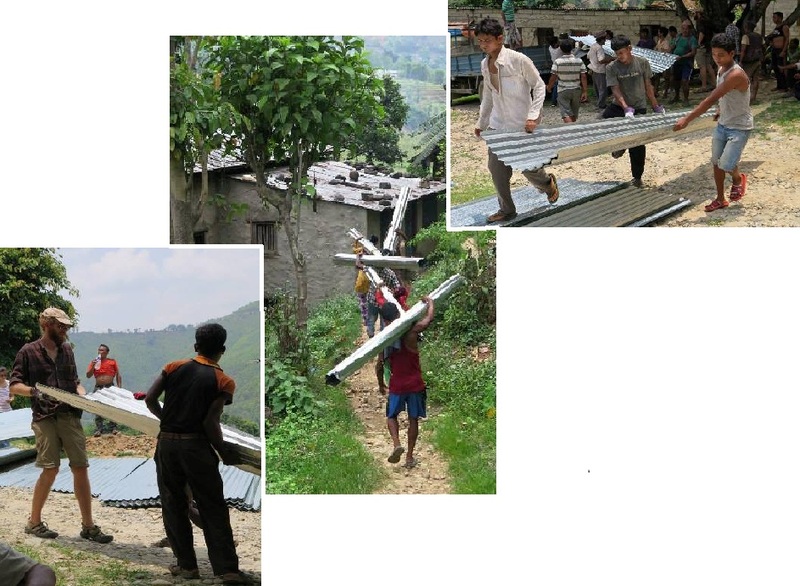 The villagers then came down on foot from their villages to collect their bundle of sheet metal. Their villages are located a two-hour hike uphill from 28 Kilos. The actual distribution of the sheet metal was a challenge. Each family received a bundle of sheet metal, which is comprised of eight pieces, varying in length from 6 to 12 feet long. There were 194 families, times 8 pieces each , for a total of 1,552 pieces of sheet metal. The truck had to be unloaded and placed into stacks of eight. This took three hours. Once the truck was unloaded, the driver and assistant joined our team to help village members in collecting their bundle. We called their name from the VDC list; they signed for receipt of the metal; they went to stand in line waiting their turn to get their metal sheeting. Everyone was incredibly cooperative with every stage of the process. They helped unload the truck; collect the sheeting for elderly or disabled community members; then helped each other roll the metal sheeting into tubes, tied with wire. These tubes were then hoisted onto their backs and carried the two and 1/2 hours uphill back to their village. It was hot, dusty, and crowded, but everyone was very happy to be working together to get metal to build or fortify their temporary shelters. I was happy to be the team photographer and first aid assistant, providing clean up and bandaids to people with small cuts on hands and legs from handling sheet metal without gloves. When it was all over, we watched a line of villagers carrying metal tubes walk down the path to the footbridge across the river, and head up to Baseri village. It was a tired and very happy team who climbed into the jeep just as a torrential downpour started. While we headed back to Kathmandu, we thought about the villagers climbing up in the rain to their destroyed homes, with a little hope and enough metal to finally have shelter. I hope you will take a look at our Facebook page, Yoga4Nepal, where you will find several photos from this first trip. I am happy to say that tomorrow, July 8th, we are going back to provide 184 bundles of sheet metal to Belingtar village, the largest and lowest of the four Ward 6 villages. Despite predictions of torrential rain, we know the families may be out in the open or scrambling under leaky half shelters, so we decided to go up and deliver their sheet metal regardless of the weather. We are only hoping the road is not blocked. I just want to say that it is because of all of you that we were able to provide this shelter for these villagers. Without your support and generous donation, we’d still be scrambling to raise enough to cover everyone. So from the whole Dhading Project team, we want to extend a resounding thank you to all of you at the Didi Project, whose love for the people of Nepal shines through as you continuously send support and caring this way. From the bottom of our hearts, thank you. And thanks from the people of Kaleri, Dhading.